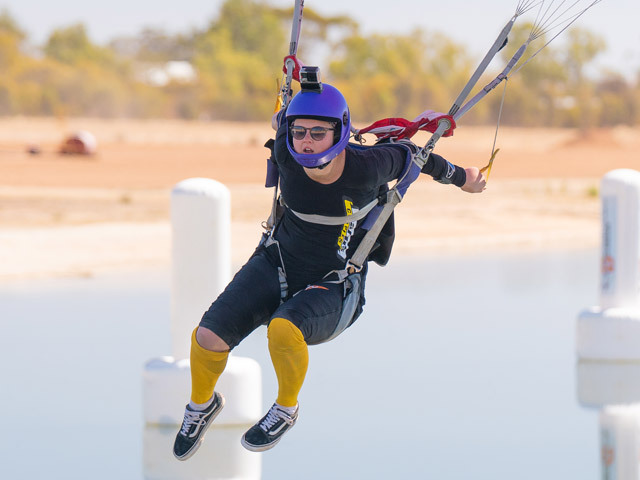 The 2019 Australian and New Zealand Canopy Piloting Championships have come to a close in Perth, and female parachutists won big – recording the most female competitors in a Canopy Piloting competition ever. Seven women contested the intermediate division title, with Shana Harris and Amy Jamieson taking the top two spots for females and 12th and 14th place respectively. Question: Congratulations on taking a top spot at the 2019 Australian and New Zealand Canopy Piloting Championships! How does it feel to be part of the record-breaking participation? Amy Jamieson: It feels amazing to be part of such an empowering group of ladies! We're all pretty new to Canopy Piloting, so getting a good start surrounded by a group of other people all hungry to grow and learn has been pretty special. Question: What is Canopy Piloting? Amy Jamieson: Canopy Piloting is a discipline within skydiving where you accelerate your parachute at the ground to increase speed, and then 'plain out' through courses over the surface of water. There are three disciplines within Canopy Piloting: speed, distance and accuracy. Question: How long have you been a Canopy Pilot? Amy Jamieson: I have only been skydiving for two years and focusing on Canopy Piloting for just under a year. This was my first competition experience, so I am pretty lucky to be able to have an opportunity to attend an event like this so early on. Question: What originally inspired your passion for Canopy Piloting? Amy Jamieson: The people I have been surrounded by as I have progressed through skydiving have been some top Canopy Pilots, so right from the start, I saw Canopy Piloting as an amazing part of the skydiving that I wanted to be involved in. Question: What challenges have you had to overcome participating in a male-dominated sport? Amy Jamieson: It's actually a very welcoming environment, so I never felt out of place being a girl among the boys. Everyone is very supportive and just wants to see you achieve your goals and improve! In saying that, when you first view the sport from the outside, it can seem a little daunting, which is why the girl's training project has been amazing in breaking down those preconceptions from the start. Question: What's a typical weeks training like for you? Amy Jamieson: I work packing tandem parachutes at Skydive Byron Bay, so every opportunity I can, I am getting on a load to jump and practice. I would say I jump about once every two days, so I'm very fortunate to be able to jump as much as I do and be surrounded by other Canopy Pilots.